Hey, Los Angeles. 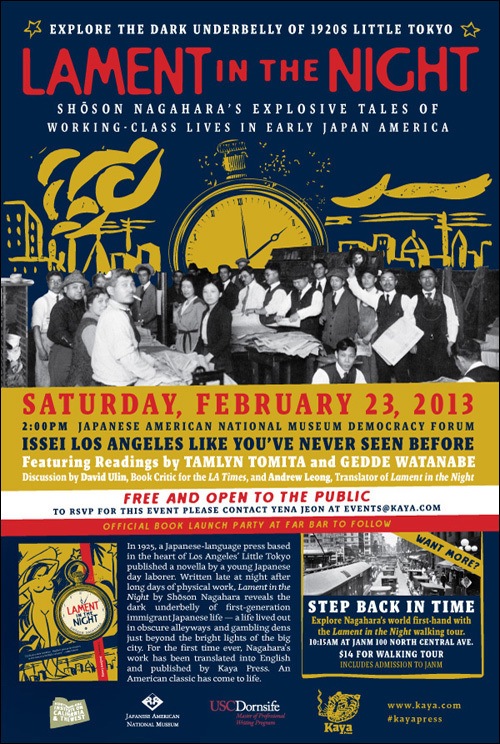 This Saturday, February 23, make a trip out to the Japanese American National Museum for a reading of Lament in the Night, a book about the dark underbelly of Little Tokyo in the 1920s. Originally written by Shoson Nagahara, it's been published in English for the first time ever by Kaya Press. Take a journey into the hidden history of 1920s Little Tokyo, with this day of celebrating the Kaya Press release of LAMENT IN THE NIGHT, originally written in 1925 by writer Shoson Nagahara and translated into English for the first time by Andrew Leong. Actors Tamlyn Tomita and Gedde Watanabe will read excerpts from the book, followed by a discussion and Q&A with LA Times Book Critic David Ulin and translator Andrew Leong. ADMISSION FOR THIS EVENT IS FREE AND OPEN TO THE PUBLIC. Reception with FREE FOOD and music by THE SADHUS OF BASS to follow immediately around the corner at FAR BAR (347 E. 1st Street, Los Angeles, CA 90012): 3:15 p.m. - 5 p.m. This event is co-hosted by KAYA PRESS, the HUNTINGTON-USC INSTITUTE ON CALIFORNIA AND THE WEST, and the USC MASTER OF pROFESSIONAL WRITING PROGRAM. More about the book: LAMENT IN THE NIGHT (Kaya Press, December 2012), a collection of two dark novellas by Shoson Nagahara, reveals the gritty realities of life in Little Tokyo circa 1925. Translated into English for the first time ever by Andrew Leong, these stories open up a new realm of American literature that has been woefully underpublished and unexplored-namely, the literary heritage of non-English speaking immigrants in America. Originally published for a Japanese immigrant readership, the title novella follows itinerant day laborer Sazuko Ishikawa as he prowls the back alleys and bathhouses of Los Angeles looking for a meal, a job or just someone to hold onto. In the second story, The Tale of Osato, a young mother works her way through bars and nightclubs after being abandoned by her gambling-addicted husband. Find out more about the event by visiting the JANM website.